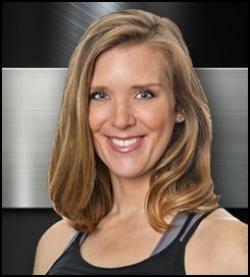 I am certified through the National Academy of Sports Medicine as a personal trainer and fitness nutrition specialist. I work with each client to design a personal lifestyle program. This program includes physical fitness, nutrition and overall well-being of body, mind and soul. Weight loss, body toning and muscle building will be worked into the program as well as nutrition instruction and pointers on other avenues for fitness and relaxation. Happy. Healthy. Fit. is a personal training program I designed for individual clients to achieve their own health and fitness goals in an enjoyable fashion. I take an approach to your training that can be maintained in your daily life so you not only conquer your goals but are setup with tools for a lifetime of fitness. If you are ready to smash your fitness goals, exceed your own expectations and have FUN contact me. Let's get Happy. Healthy. Fit! I've earned a bachelor degree from Indiana University and a masters degree from Indiana Wesleyan University. I have been a long distance runner for over 20 years competing in half marathons and marathons with my sister through the hills of West Virginia along the route of the infamous Hatfield-McCoy feud to running a nighttime marathon in Oak Ridge cemetery where Abraham Lincoln's tomb resides and many interesting places in between! I love running, fitness and always try to make it fun along the way. My passion for fitness and a healthy lifestyle led me to start my own business focused on personal training. After leaving my corporate job in higher education, I decided to help others lead a healthy lifestyle and help people crush their fitness goals. You'll find that my encouragement and enthusiasm for working out will be just what you need through a tough workout.